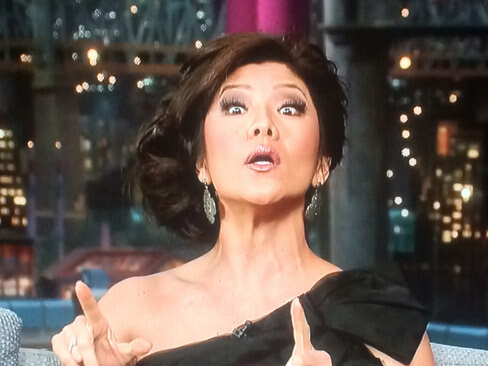 The most revealing thing about Julie Chen on the Letterman show the other night was not her off-the-shoulder black dress, or the high-heeled shoes that give her an awkward waddle, or even the phony “fly-by” wave to the audience that made her more beauty queen than anchor gal. No, the most revealing thing was when the round-eyed Julie talked about her 4-year-old Charlie, and how she and her husband, CBS president Les Moonves, don’t lie—at least to their son. Julie would have gone on, but the audience laughed as Letterman did a double take. Letterman said it was just odd that those two questions–on babies and Michael Jackson–were the ones in which absolute truth would have occurred to her. It was a rare candid moment that revealed the state of Chen’s moral GPS. I wrote about Chen last September, when she revealed that she had eyelid surgery to make her look less Asian than she was–as a career move. But I was surprised she still felt that the basis of the criticism about her had to do with her denial of her heritage. That’s a part, sure. But a small part, really. The objectionable thing is she may have had a discrimination case against her then-boss at a Dayton, Ohio TV station, who told her she’d never make it to the anchor desk because of her Chinese American eyes. But Julie didn’t act and failed to speak out, until “her secret” could help her with her talk-show’s ratings. I guess she didn’t have a story about child molestation, anorexia, or how she replaced the MSG in her food with some other white stuff, like crack or heroin. That would have been a Rob Ford-like ratings grabber. But she had a claim to victimhood. Discrimination! And her response was–get eye surgery? That’s the kind of thing that makes my eyes round. OK, Julie’s no MLK. If she were Rosa Parks, she’d be camped out in the back of the bus, batting her eyelashes with her thumbs up. As a career broadcaster myself, I know how hard it was to navigate through the politics of race in the industry. She probably could have performed the lobotomy on him herself, had she become the doctor her parents probably wanted her to be. It’s clear to me that Letterman was fishing to see if Chen had even considered talking to a civil rights lawyer first, instead of her showbiz agent. So I did it for her, as a public service for any folks out there considering the choice between a fight for justice versus plastic surgery. I reached out to three top-ranked lawyers who are experts in the field. What you raise, from remarks of the earlier employer, is common, prejudicial, but complicated vis-a-vis discrimination. Generally, a remark about an Asian woman’s eye shape in a negative way could be discrimination by race or maybe nationality. Practically, it would have to be strong enough or repeated enough to create a hostile environment. If, however, it is attached as a reason for firing, not hiring or some other tangible job condition, it could be more straightforward discrimination. Like everything else, however, there are complications. If a racial characteristic is a “bona fide employment qualification,” it could be allowed, though that is very narrow. For example, a woman or a Black man may be discriminated by race or gender in casting an Abraham Lincoln role, but the gender or race in those cases would be a qualification. This exemption is very narrow, though, and isn’t often allowed–entertainment is one of the few areas it is common. It would be hard to say, for example, that we don’t want Asian women newscasters in Topeka because whites would prefer folks that are white. Further, an argument could be made that commenting that a particular person’s eyes look tired isn’t necessarily a statement that natural Asian eyes look tired as a group. I would say, though, that such a remark explaining why an Asian woman doesn’t get the job would probably be seen as discriminatory. Whether it would be worth pursuing legally is another story. The burden is on the plaintiff to prove her case. Asian American legal stalwart Dale Minami, the man who led the charge to vacate the WWII conviction of Fred Korematsu, said Chen may not have had enough to bring a lawsuit back then. Unless, of course, you marry the president of a network as insurance, and use that to build up your sense of entitlement. If that happened today–if a supervisor told an Asian reporter that she “will never be on the anchor desk because she’s Chinese,” and then went on to say that “because of her heritage, because of her Asian eyes, she looks disinterested… bored,” — there’s no question that she would have a race discrimination claim. The employee is clearly being denied a promotion because of her race. That said, the racism that pervades so much of our workplace is often much more hidden nowadays. The station manager today would probably know better than to come right out and state his racial preferences, and would be more subtle in his criticism. What if he just said that she looked disinterested and bored, without explaining that it was because of her Asian eyes? Then the case would be much harder to prove. We would have to try to find comparators–was there a Caucasian with less experience who vaulted over the Asian employee to the anchor desk? Were there other comments that indicated that the manager was focused particularly on the Asian employee’s eyes? Or what if he said that he didn’t want an Asian anchor because she is “unrelatable” to her mostly white audience, as Julie Chen’s boss also said? That too would probably be a winnable case, but does hint at other more complicated cases where stores essentially validate (discriminatory) customer preferences through facially neutral policies, like English-only in the workplace. While an employer is not permitted to simply adopt discriminatory customer preferences, employers are permitted to impose neutral policies that may have a disparate impact on minorities or women if the policy is “job related for the position in question and consistent with business necessity.” That can be a complicated factual inquiry, which requires a close examination of the nature of the job. No doubt, when you come face-to-face with discrimination, it is a proverbial “crossroads” moment. Do you sing the blues? Or do you make that deal with the devil? Do you fight in a way that could end an ongoing practice and spare others? Or is it enough just to help yourself?